What's so great about a hobby if your best friends can't come along too? 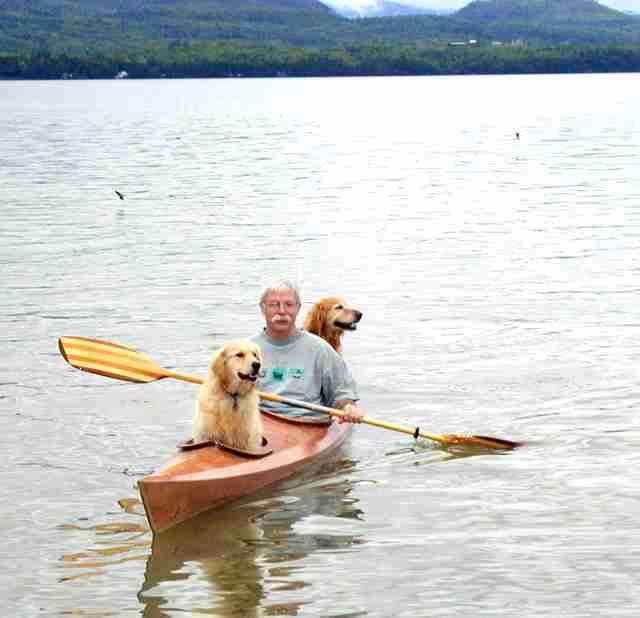 Fortunately for David Bahnson, a retired orthopedic surgeon from Vermont, he's figured out the perfect way to share his favorite pastime with his pets - by building a kayak designed with them in mind. Now, any adventure out on the water can be complemented by the addition of his happy dogs. "They seem to love it," Bahnson told The Dodo. "They get excited when we'd pull the kayaks out and see that we were going." 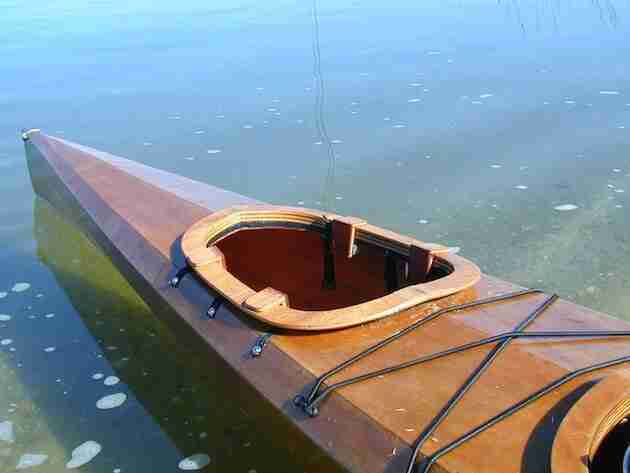 Bahnson first had the idea after seeing how easily his first dog, Susie, could fit inside the baggage compartment of his kayak, which he built from a kit by Pygmy Boats. The addition of a ring, or "coaming," around the opening helped her stay cozy and dry as they piloted the vessel through the water on their outings. It wasn't long before Bahnson, his wife and Susie were joined by another canine family member, Ginger. Not wanting to leave the new pup out during their kayaking trips, he made yet another modification to the boat. "When we got Ginger, I just put in another hole," said Bahnson. "It's like a triple kayak, only there isn't enough room for the paddlers to put their feet - but it's perfect for a dog." It never takes much convincing for those furry first mates to settle into their seats when it's time to get going in the kayak. In fact, though Bahnson rarely paddles out too far from land, the dogs seem to understand how to keep safe on their journeys. 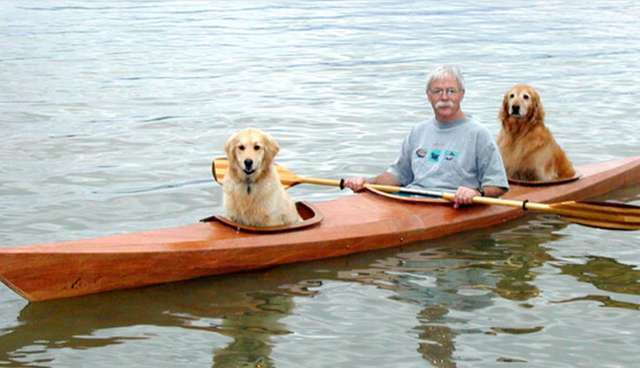 "They are trained to get in the kayak themselves on command. They sit down, and off we go. When we come ashore, they'll stay seated until I tell them it's OK to get out. They never hopped out into the water, actually," he said, adding that the dogs are strong swimmers regardless. 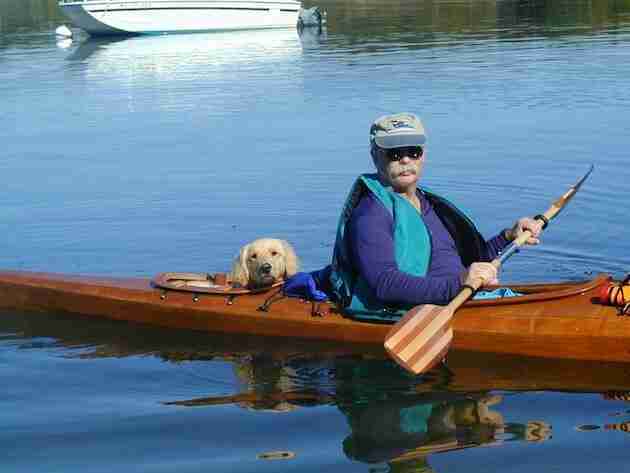 "We've seen other people kayaking with their dogs, but they usually have them in the cockpit with them. That's kind of awkward, so this just worked out better," he said. "They each have a little dedicated space, and they just sit and enjoy the ride." Sadly, Susie and Ginger have both since passed away after lives filled with adventure with Bahnson in the custom boat he built for them, but the tradition continues with the family's newest pets. And while the sight of dogs out for a day of kayaking tends to attract a fair bit of attention and more than a few happy glances from passersby - no one could be more pleased than the passengers themselves. "I love my dogs. I love training them, the companionship. 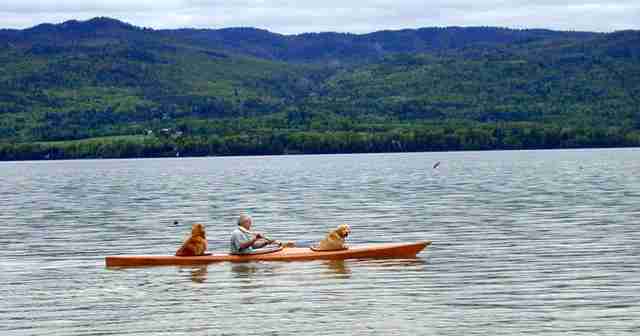 We've gone miles and miles of paddling with our dogs," said Bahnson. "They just really enjoy going places."